With a beautiful setting just north of Marion, Allen’s is the perfect place to experience a little taste of nature. 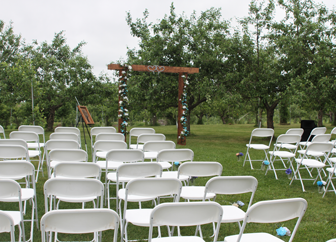 Allen’s is a family run orchard that host’s field trips, weddings, bonfires and much more. Allen’s offers over 50 varieties of delicious apples that are available in various parts of the year. Take advantage of our “U-Pick” option during Open Season where you get to pick the apples you want right off the tree. Allen’s also has fresh grown produce, unique gifts, and scrumptious treats like donuts, turnovers, cookies, pies and caramel apples! 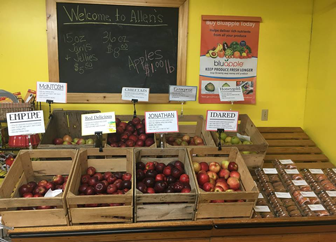 Allen’s is more than just apples. Our stores features unique gifts and products that you won’t find anywhere else in Linn County. Visit our products section for more details about what products and gifts we sell. Allen’s is proud to feature products from: Molly and You, Annie B’s, Watkins, Almost Famous Popcorn Company, Blackberry Patch and much, much more. A reminder that Allen’s is a Non-Smoking orchard. 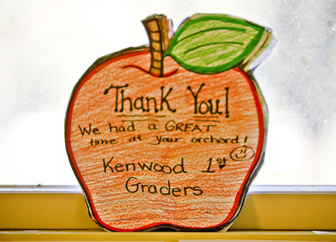 We love to teach about apples! Contact us at (319) 377-1408 to schedule a field trip for your group. Times fill up fast so don’t delay. Students will be educated about how apples grow, how a working apple farm operates, take a tour of our facilities, and have story time. Cost for school groups is $4.50 per child and each child leaves with a treat. Allen’s would love to host your special event and/or bonfire. Contact us to schedule a small wedding – up to 75 people, family reunion, birthday party or a gathering of your choice. We have a beautiful gazebo available along with a D.J. and event planning services. Over 35 varieties of apples including Jonathan, Red Delicious, Cortland, Sweet Sixteen, Lura Red, and Empire. We have more than just apples.